Loving myself first means three things to me: forgiving, showing up, and sharing. Forgiving myself: Since I was a child, I have been told I am just too sensitive, thin-skinned, needlessly vulnerable. I have always felt things incredibly deeply, and it shows. For a long time, I allowed others to take advantage of this part of me and even chastise me for it, telling me it was a flaw, a softness that needed to be hardened. But loving myself started with forgiving myself for these perceived weaknesses, which then opened up the opportunity to protect my vulnerability, and even, to insist upon it being something helpful and constructive. Showing up for myself: Once I learned to embrace the complexities of my emotional life, I was more ready to defend, preserve, and nurture it. This meant being more verbal when I felt I was being mistreated or ignored or emotionally abused; it also meant coming to the difficult and liberating conclusion that no one else was going to do this for me. As it goes, when I began articulating my worth, I lost some people who I thought were my friends. But the process has left me with a small, strong group of people I consider my chosen family. They respect, love, and appreciate me. Sharing myself: Once I learned to accept, appreciate, and defend who I am, I became more ready to share myself with the world. Part of loving myself means using my talents, intellect, and skills toward something that fulfills me: right now, it is through teaching and contributing to Human Rights scholarship. I hope to continue doing this once I graduate: I wish for myself a fulfilling life, and it’s my intention to show up and make that dream a reality. My favorite part of self-care has been creating rituals. My oil baths are legendary in my household, my partner understanding that this time is my time: I use organic oils and salts in a warm bath, and sink into the water with candlelight flickering around me. I light incense, and on a particularly tough day, smudge the space with sage. It is my moment with the divine, where I cleanse and nourish my skin and my mind after work. It helps me shed the stresses of the day. I have discovered great solace in yoga, and practice at least 3 times a week staying present, feeling graceful (sometimes clumsy! ), and building strength. This, in addition to weekly cardio, helps to keep my mood elevated and my mind clear. My personal fitness routine has helped me build a completely new self-image: instead of the un-athletic gym class dropout I thought I was, I know now that I am, in fact, made of poetry and sinewy muscles that can balance, extend, and flex. So, I am going to overcome an obstacle just by writing this answer, and in so doing, I hope to demonstrate my idea of what self-love is. I live with depression, a mental illness that affects women and men around the world. As I grow and change, my depression changes with me. It has had different iterations, and manifests itself differently at different stages of my life. One of the most difficult stages was when I was a freshman in college: I was feeling profoundly alone, and with no one to confide in, I began having thoughts of suicide. I had no desire to eat, was losing weight rapidly, and did not leave my dorm room for days on end, save to go to class. It wasn’t until I had the courage to call my mother, and tell her that I was not doing okay, that I had been thinking of ways to quietly end my life. I told her how I was feeling, and asked her for help (Thank you, Mom, I love you). That was seven years ago, and I could not be prouder of my 18-year-old self for reaching out, and for continuing to struggle. While many may think that this was a time of weakness, I see it as a display of strength. I wanted to keep fighting, and fight I did. I am writing this now because I made that phone call. I helped save my own life. I reject the notion that we need to be quiet about these experiences: no one should ever suffer in silence or isolation. Our cultural stigmas around depression and other mental illnesses breed silence, and I refuse to perpetuate this damaging norm. If you are suffering, please tell someone. There are people who care about you, who want to help you leave this pain behind, and want to help you embrace your beautiful life for everything it could and will be. I look back on that time, that person, with compassion and sadness. I see now I rarely allowed myself to dream: I was so enveloped in my depression that I could not see myself growing up or growing older. I did not think I would make it so far. I am learning now what it’s like to have a vision for my future, and it is overwhelming and wonderful and absolutely terrifying all at the same time. I see a social worker for therapy, practice mindful meditation, and read books that address the sources of my depression: for me, it is shame. Shame is a very powerful thing, as an emotion and as a socially constructed tool to keep women caged. Brene Brown’s book I Thought It Was Just Me (but it isn’t): Making the Journey from “What Will People Think?” to “I Am Enough” both articulates this struggle in the context of womanhood and provides some resources for how to cope with shame. It has provided me new ways to protect my vulnerabilities and use them constructively, to build a new idea of who I am and who I want the world to know. What have you learned from self love? Oh, I have learned so, so much from self-love, and continue to learn more. I have learned I am worthy, that love for myself multiplies and becomes love for and from others. I have learned that treating myself with compassion means I am more ready to treat others with compassion. It has given me a sense of belonging and community, a sense of possibility and a lasting relationship with myself. Meaghan also tunes in to self-care through writing and receiving love from her cat, Chickadee. Top Right + Bottom Left: I have a lot of fun trying on different types of self-presentation, and I think style is a great way to express a multi-faceted personality. It is something accessible and fun for me, and helps me to take myself not-so-seriously. Bottom Right: I am learning how to embrace the beauty of my body, to celebrate its strength and accept its flaws. This is a new concept for me, one I’m still exploring. Thanks, Meaghan for sharing your LYFF story! You are definitely a Phoenix Rising. Categories: Love Yourself First! 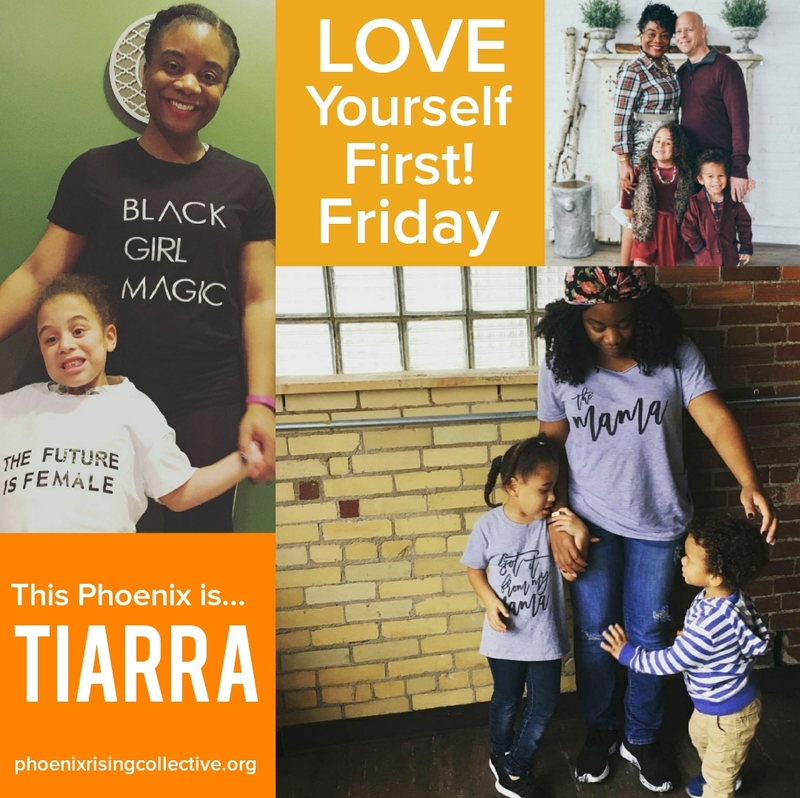 Friday | Tags: Brene Brown, depression, empowerment, healthy self-esteem, inspiration, Love Yourself First, Love Yourself First Friday, self-care, self-care rituals, self-esteem, self-love, the phoenix rising collective, whole living, women and wellness | Permalink. Almost 365 days have passed since becoming the Motherhood Empowerment contributor for Phoenix Shine, The Phoenix Rising Collective’s blog. My, my, my (long inhale and exhale) so much has happened within the past year. Through all the laughter with family and friends, financial challenges, job hopping, difficult living arrangements, tears of depression, and watching my boys grow up and out in height, personality, identity, hobbies, and intellectual capabilities – I’m STILL standing. I’m STILL here! Speak honestly to myself, first and foremost; and then share my truth with others. Create the balance of listening AND adhering to the messages from my passionate heart and my rational mind. Completely surrender to the notion of living to fulfill my life’s purpose. So, in mid-July, one early Sunday morning, after a long sleepless night of tossing, turning, and deep inhalations of the Houston, Texas humidity, pollen, and dew, I began the initial phases of doing…well, more so…BE-ing all of the above. I spent the last $237 in my account (reserved for partial payment on a bill) for a round trip ticket to Michigan with the intention of seeing my honorary mother (stepmother) and best friends. I separated from my significant other of eight years. I went to work the next day and quit my job with no other prospects anywhere close to the horizon. A few weeks later, I finally communicated some deep and dark feelings to my biological mother – feelings that had been churning inside me since I could recall my earliest memories as a toddler. This led to a healing breakthrough for us. Let me tell you, after all that, not only did I feel like I had lost 100 pounds. For the first time ever, I felt serenity, excitement, unrelenting strength, joy, and absolute readiness to create the rest of my life exactly how I want! In recent weeks, doors I didn’t know existed have widely and enthusiastically flung open, ushering me into the greatness that is my purpose. I was awarded a scholarship to complete my Yoga Instructor certification (which I’ve begun preparing for; hence the soreness in practically every muscle in my body). I’m writing programs and developing a curriculum for a non-profit organization committed to youth empowerment. I teach English as a second language to Spanish speaking and Vietnamese adult learners. And I’m the new Program Coordinator for the Houston Center for Literacy which is dedicated to improving the literacy landscape of the city. Fearless: You fear less; thus, welcoming the vulnerability that comes with the discomfort and uncertainty of not having every single detail of your life planned. You find solace in knowing the heavens and earth are conspiring in your favor to bring forth what you really want. You express gratitude because all that you’ve prayed long and hard for (plus even more) comes to fruition. You simply say,“Thank you,” and pay it forward. Honesty: Speak the truth and nothing but the TRUTH so help you! According to Neale Donald Walsch, honesty is one of the highest manifestations of love, so if the intention is to love ourselves, let’s start by being honest. How do you want to feel each day that you wake? What’s your ideal career? How can you make a lucrative income pursuing the one or two or several things that bring you great joy and passion? What does optimal health look like on you? What are some non-negotiable and/or areas of flexibility within an intimate, committed relationship for you? In what area(s) can you improve your parenting skills? I dare you greatly to answer all of these questions, honestly. And don’t judge your answers! Clarity: A book that really helped me gain clarity in my personal and professional life is The Passion Test by Janet Bray Attwood and Chris Attwood. Without giving away all the details (because I hope you’ll do your research and grab a copy for yourself) the book provides a very precise formula for helping you gain significant clarity on the who, what, when, where, and how of pursuing your passion(s). Life Flows Easily: When you’re living what you love, life flows easily. You’re so swept up in the new routine of fearlessness and honesty (and with a brand new vision for pursuing your goals) that you become much less concerned about doubt, judgment of others, and the drama of “Who Shot John.” Now, this is not to say there won’t be hiccups and challenges along the way; ideally, you’ll feel more inclined to be aware of the now (or present continuous, as I’m teaching my students) and the power you have to create it exactly how you wish it to be. Attracting Goodness: Like INergy attracts Like INergy. The thoughts, words, and behaviors you set your intentions on will always return to you. Your intention will reflect either ugliness or beauty, so create beauty, Goddesses! I’d like to especially dedicate this to Brene Brown. I’ve used quotes from her glorious masterpiece Daring Greatly throughout this article. I’d like to extend an extra special THANK YOU to Ayanna Jordan for inviting me to The PRC family, embracing my writing, compassionately supporting me, and encouraging me to continue to strive towards my own GREATNESS! Also, Traci Evadne Currie, gratitude, gratitude, gratitude and more gratitude for operating in your greatness and inspiring me to do the same! 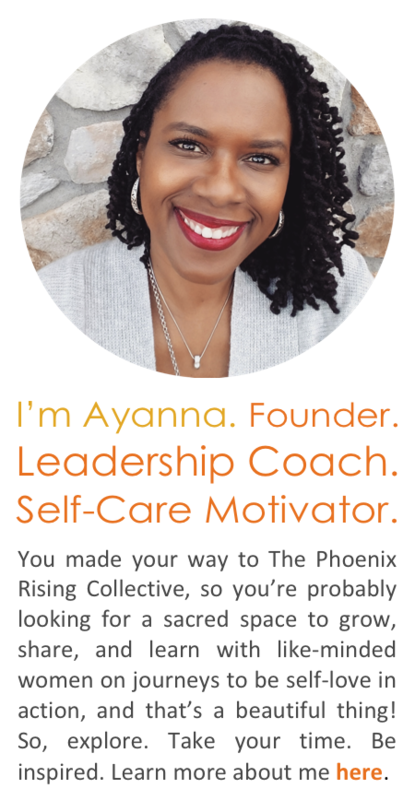 W. KaNeesha Allen is The Phoenix Rising Collective’s Motherhood Empowerment contributor. She is an educator with extensive project management, student support services, and community outreach experience in K-12 and higher education institutions. She is also the mother of two extremely rambunctious and fun loving boys – Ausar and Mikah. While often seeking to master the balance between being a highly engaged mother and taking time to BE with herself in the divine energy of the universe, KaNeesha finds peace, solace, and regeneration through meditation, Vinyasa yoga, and her “Sistah Circle”. As the Motherhood Empowerment contributor, she welcomes mothers from everywhere to join her on a journey of self-discovery and evolution towards harnessing, embodying, and emoting the Goddess power within. Read her latest posts. 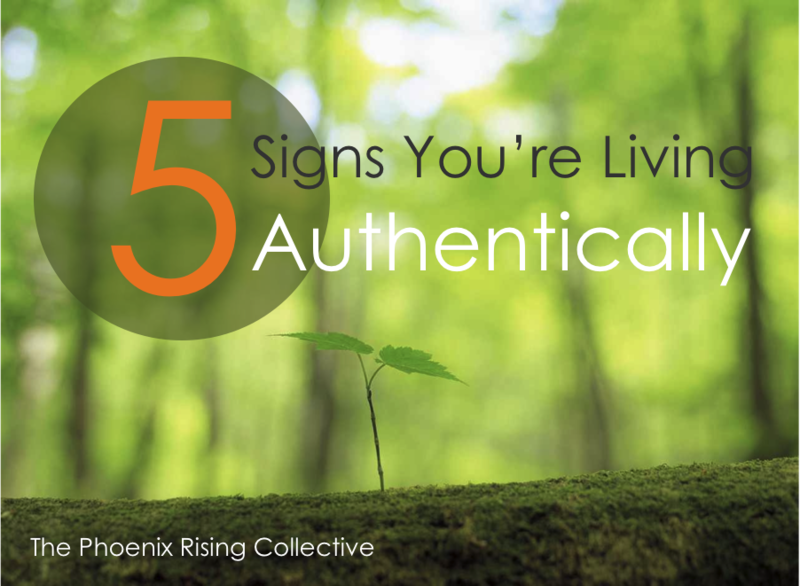 Categories: Self-Care + Personal Growth | Tags: authenticity, Brene Brown, healthy self-esteem, inspiration, intentional living, Living Authentically, self-care, self-esteem, self-love, the phoenix rising collective, transformation, whole living practices, wholeheartedness, women and wellness | Permalink. SELF-LOVE TIP OF THE DAY: I Let Go of the Need to be Perfect! We were searching for a bit of inspiration for the Self-Love Tip of the Day and found that this definitely hit the mark! Perfectionism…LET. IT. GO. once and for all. 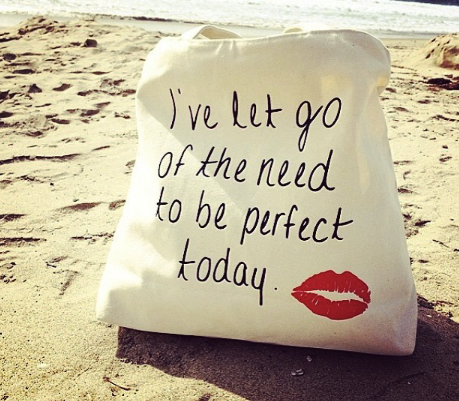 Shout-out to Samantha Marie Davis (designer) for creating this awesome bag as a reminder to let go of being perfect! Interested in the bag? Check out Lipstick Affirmations. Create the day you want, Phoenix! Be self-love in action. 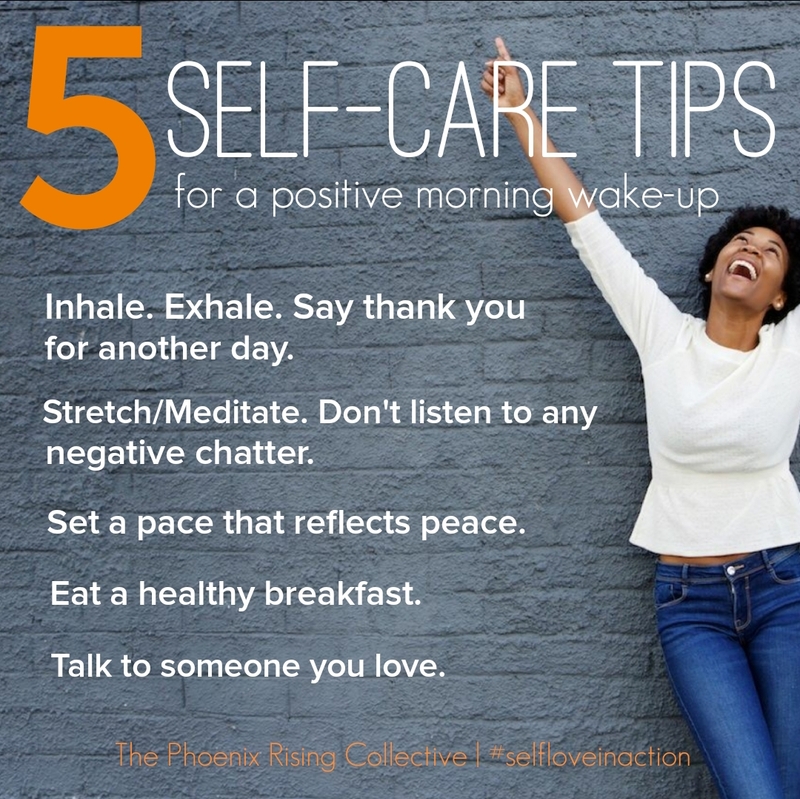 Categories: Affirmations | Tags: Black women and wellness, Brene Brown, healthy self-esteem, healthy striving, Lipstick Affirmations, perfectionism, positive affirmations, Samantha Marie Davis, self-love, the phoenix rising collective, whole living, women and wellness | Permalink.